We usually have a brush bot running at our booths, and the kids love it! They are incredibly easy to make, and relatively inexpensive. Toothbrush. I get mine at the dollar store! Micro vibration motor or vibrating mini motor disc. Make sure you get one with wires, unless you want to solder some on, which means more materials and tools. Coin cell or button cell battery. The battery you get will depend on the motor. We usually get the vibrating mini motor disc, which works from 2V to 5V, and use a 3V CR2032 Lithium coin cell battery. Double-sided mounting tape or squares. I prefer the 3M mounting squares, because when we do this with kids, it’s much easier to just give them a square than have to cut/tear off a chunk from a roll. Wiggle (googly) eyes are optional. Some kids like to add them to jazz up their bots. If you are local, we have a kit that includes the toothbrush, motor, and battery. You’ll just need to supply the sticky stuff and tools, or if you stop by our booth at an event, we’ll let you use ours to make your own. Wire cutter/stripper/crimper. You might not need this, but it’s a good tool to have anyway, just in case. Use the cutting pliers to cut the toothbrush head (with bristles) off of the handle. Peel the paper from the mounting square, or a small piece of mounting tape, and attach it to the middle of the toothbrush head. If there is less than about 1/4″ of wire exposed on both of the wires, use the wire cutter/stripper/crimper tool to strip the insulation until you have about 1/4″ exposed. Place the exposed part one of the wires from the motor on the mounting square. I usually do this with the black (or blue) wire, for consistency, but with the motors we use, the polarity doesn’t matter. Now cover the exposed part of the attached wire with the battery. Again, it doesn’t actually matter which side, but I typically place the negative side of the battery on the black wire. Attach the motor to the robot. 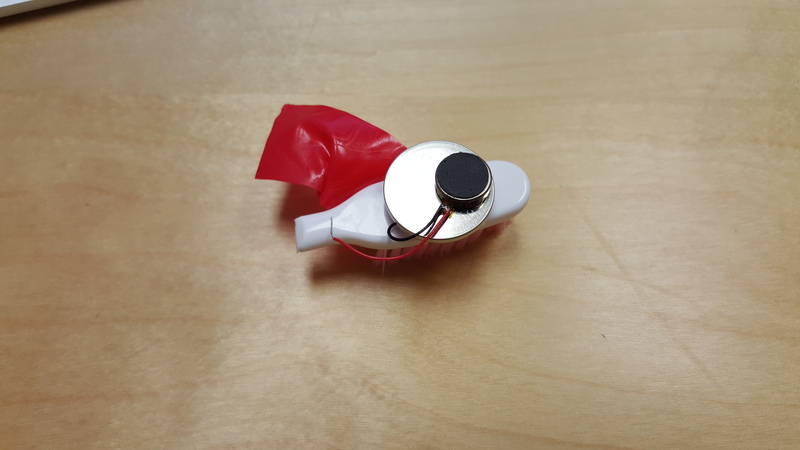 The vibrating mini motor disc that we use has a sticky side, so I usually just peel the paper from there and attach the motor to the top of the battery or toothbrush. Touch the other wire (red, for me) to the top of the battery. It should vibrate! I usually secure the red wire to the top of the battery with some electrical tape. If you wish, decorate the brush bot with the wiggle eyes. It’s a bit easier to do that if you detach one of the wires. The on/off switch for this robot is the electrical tape. Remove it, and the wire it’s securing, and then attach the wire somewhere else on the toothbrush so it’s not touching the battery to turn the brush off.